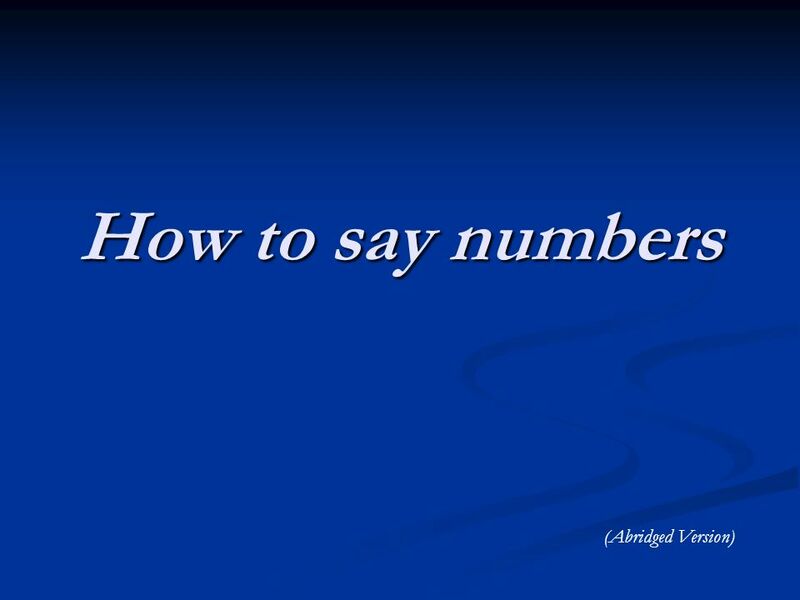 How to say numbers (Abridged Version). How do you say … 325 ? 325 ? 719 ? 719 ? 3,077 ? 3,077 ? 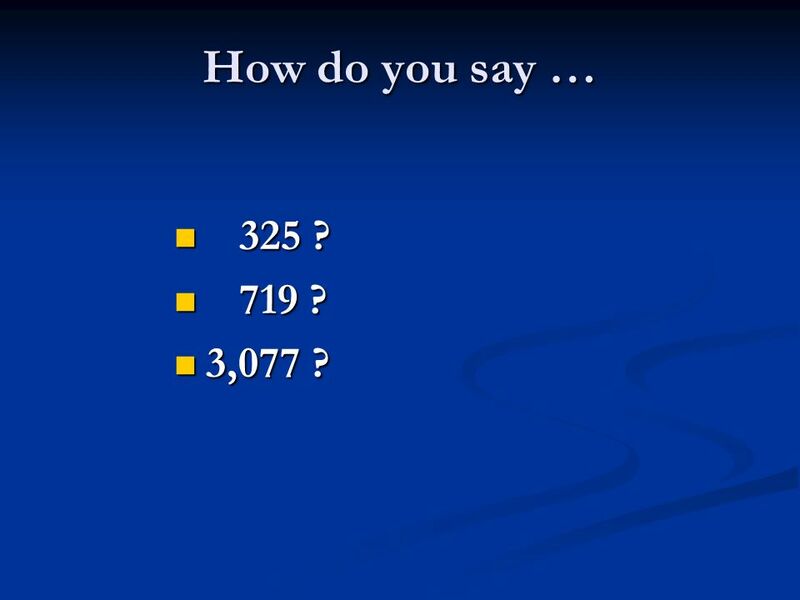 2 How do you say … 325 ? 325 ? 719 ? 719 ? 3,077 ? 3,077 ? 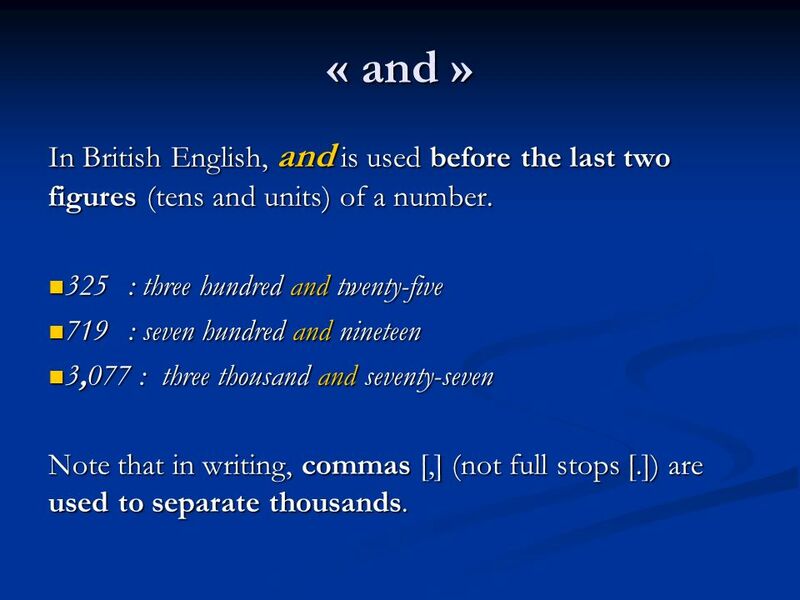 3 « and » In British English, and is used before the last two figures (tens and units) of a number. 325: three hundred and twenty-five 325: three hundred and twenty-five 719: seven hundred and nineteen 719: seven hundred and nineteen 3,077 : three thousand and seventy-seven 3,077 : three thousand and seventy-seven Note that in writing, commas [,] (not full stops [.]) are used to separate thousands. 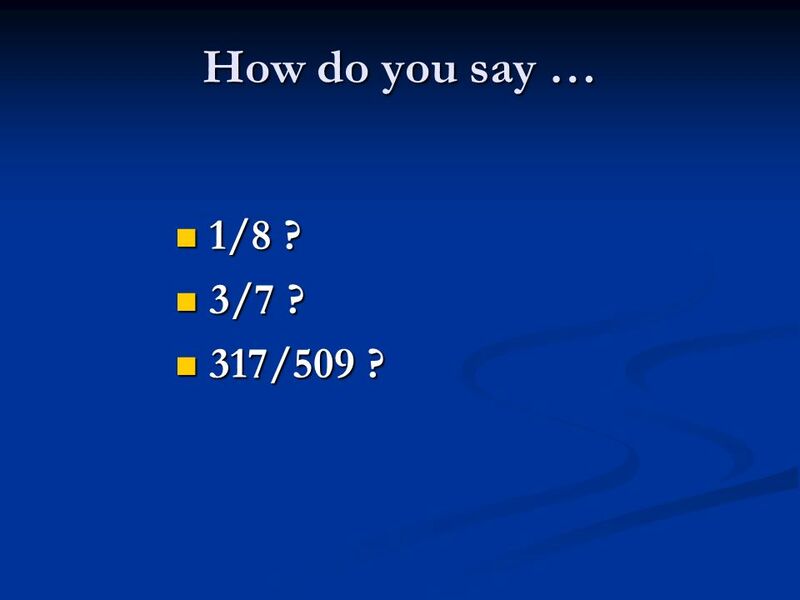 4 How do you say … 1/8 ? 1/8 ? 3/7 ? 3/7 ? 317/509 ? 317/509 ? 6 How do you say … 0.5 ? 0.5 ? 3.375 ? 3.375 ? 8 How do you say … 0 ? 0 ? My account number is : 41326069 ? My account number is : 41326069 ? 0° F ? 0° F ? Manchester 3; Liverpool 0 (football) ? Manchester 3; Liverpool 0 (football) ? 15-0 (tennis) ? 15-0 (tennis) ? 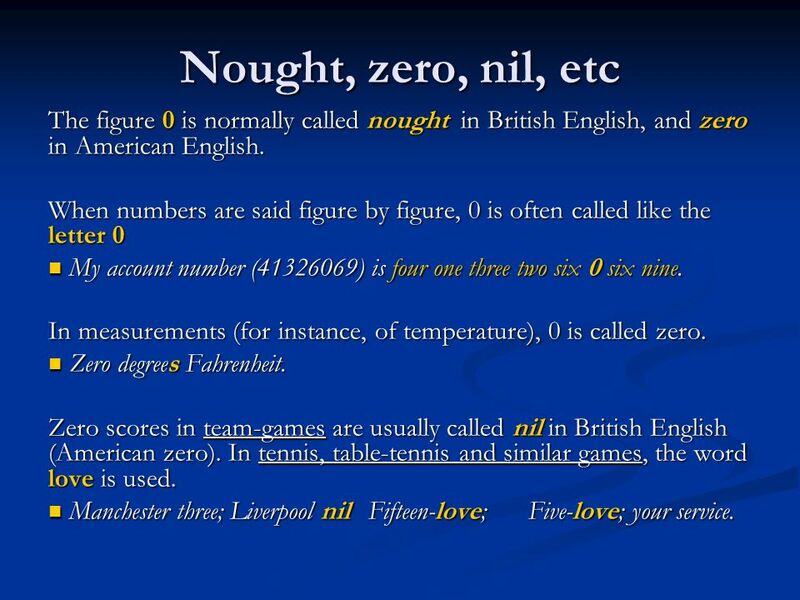 9 Nought, zero, nil, etc The figure 0 is normally called nought in British English, and zero in American English. When numbers are said figure by figure, 0 is often called like the letter 0 My account number (41326069) is four one three two six 0 six nine. My account number (41326069) is four one three two six 0 six nine. In measurements (for instance, of temperature), 0 is called zero. Zero degrees Fahrenheit. Zero degrees Fahrenheit. Zero scores in team-games are usually called nil in British English (American zero). In tennis, table-tennis and similar games, the word love is used. Manchester three; Liverpool nilFifteen-love;Five-love; your service. Manchester three; Liverpool nilFifteen-love;Five-love; your service. 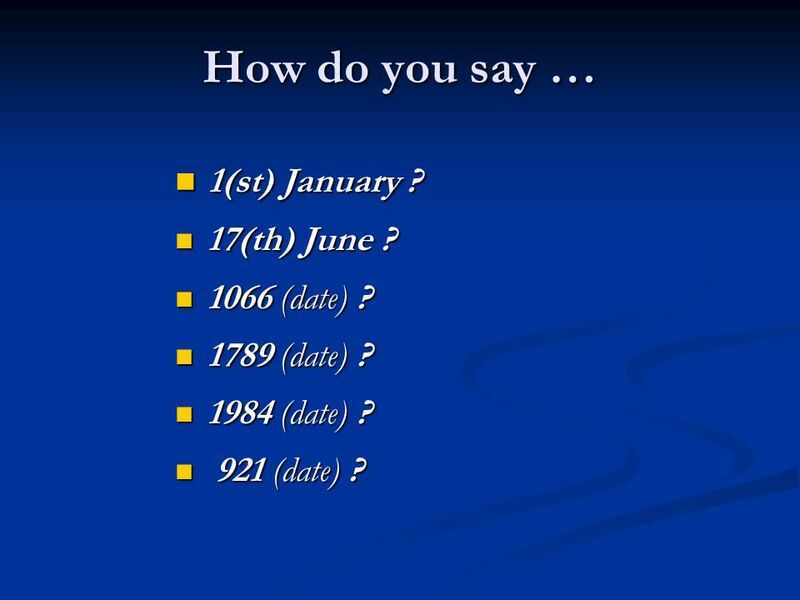 10 How do you say … 1(st) January ? 1(st) January ? 17(th) June ? 17(th) June ? 1066 (date) ? 1066 (date) ? 1789 (date) ? 1789 (date) ? 1984 (date) ? 1984 (date) ? 921 (date) ? 921 (date) ? 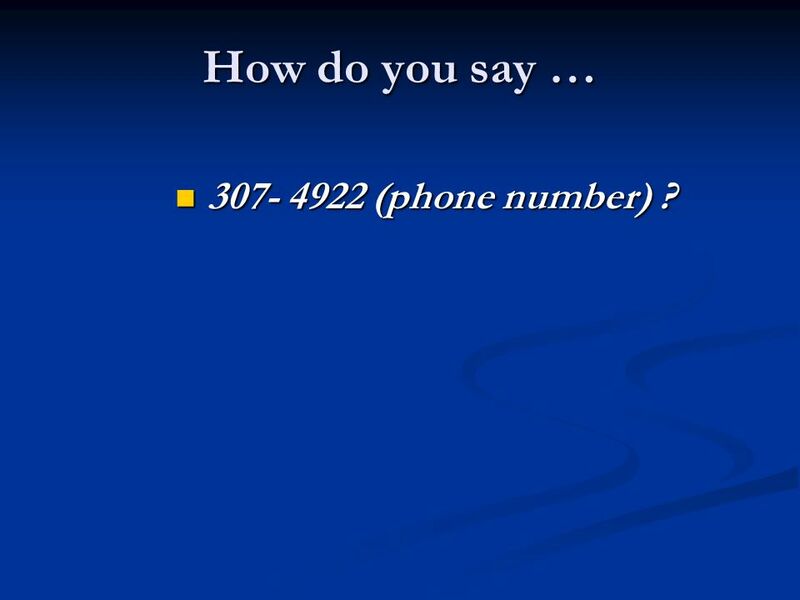 12 How do you say … 307- 4922 (phone number) ? 307- 4922 (phone number) ? 13 Telephone numbers In phone numbers, we say each figure separately. 0 is called like the letter. 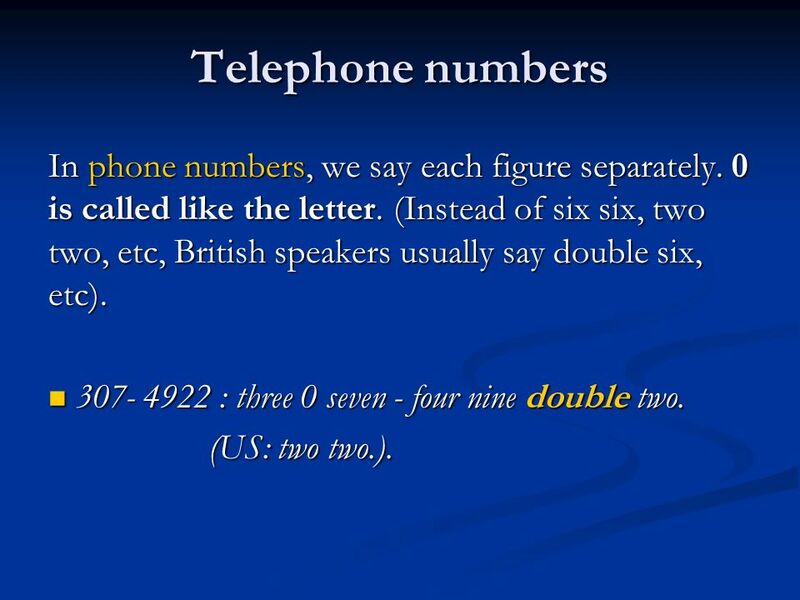 (Instead of six six, two two, etc, British speakers usually say double six, etc). 307- 4922 : three 0 seven - four nine double two. 307- 4922 : three 0 seven - four nine double two. (US: two two.). 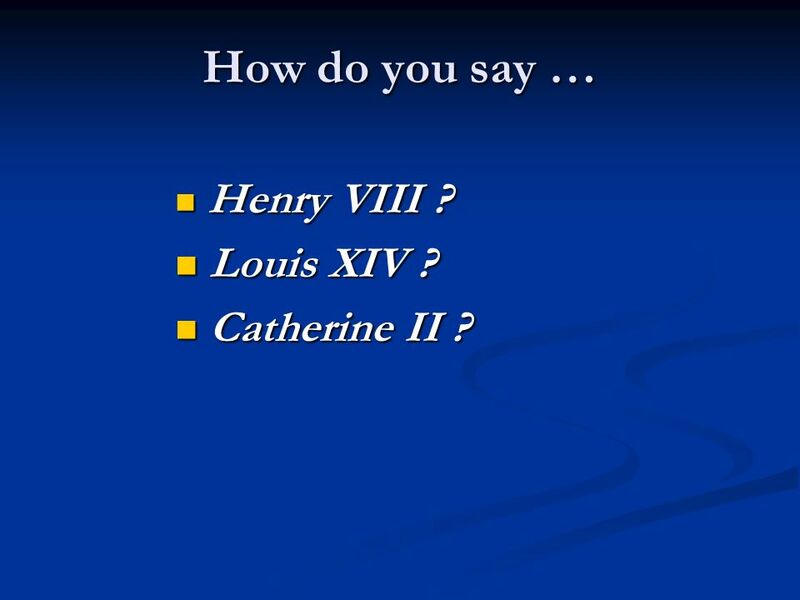 14 How do you say … Henry VIII ? Henry VIII ? Louis XIV ? Louis XIV ? 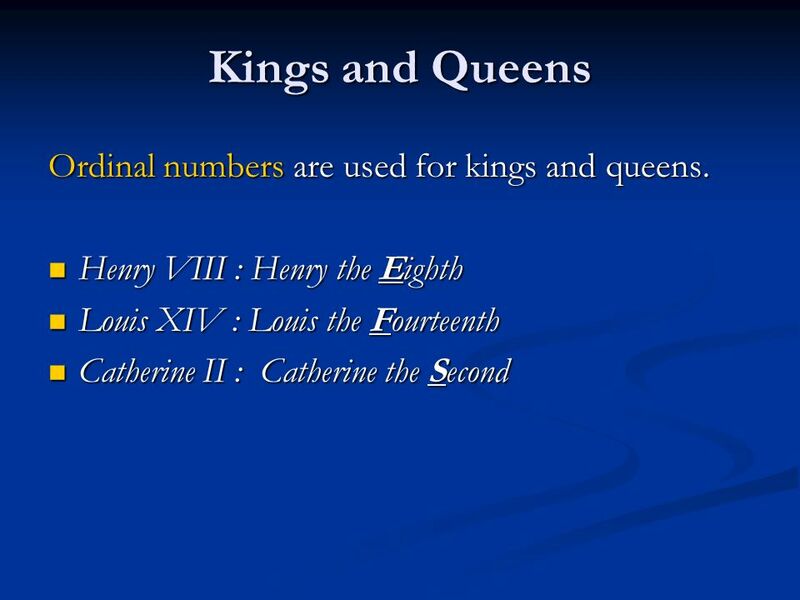 Catherine II ? Catherine II ? 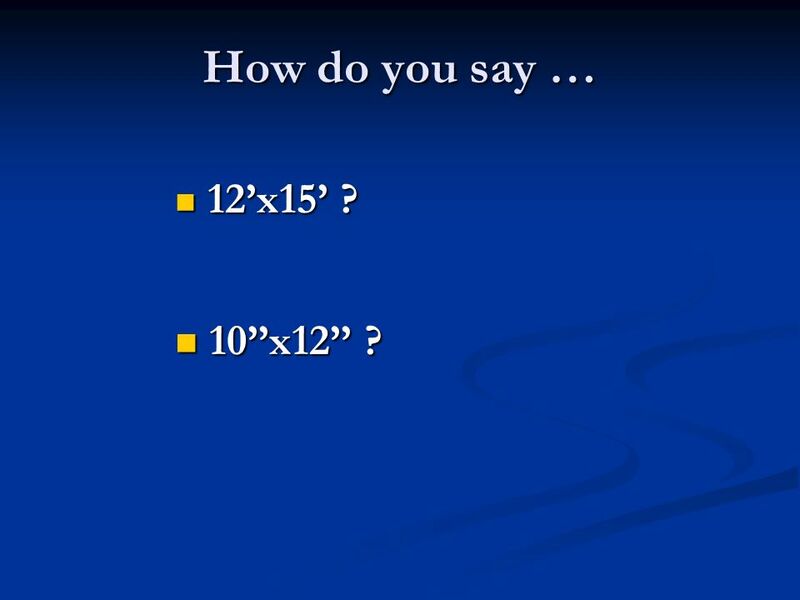 16 How do you say … 12x15 ? 12x15 ? 10x12 ? 10x12 ? 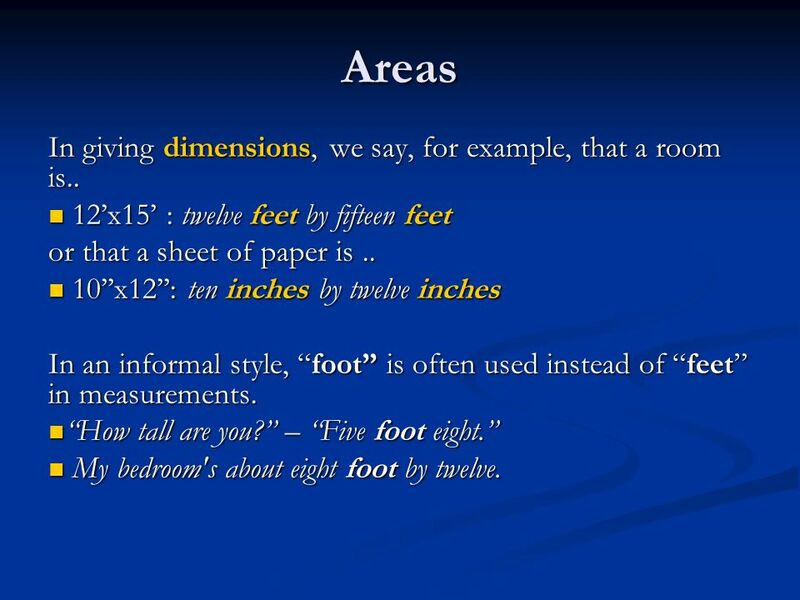 17 Areas In giving dimensions, we say, for example, that a room is.. 12x15 : twelve feet by fifteen feet 12x15 : twelve feet by fifteen feet or that a sheet of paper is.. 10x12: ten inches by twelve inches 10x12: ten inches by twelve inches In an informal style, foot is often used instead of feet in measure­ments. How tall are you? – Five foot eight. How tall are you? – Five foot eight. My bedroom's about eight foot by twelve. My bedroom's about eight foot by twelve. 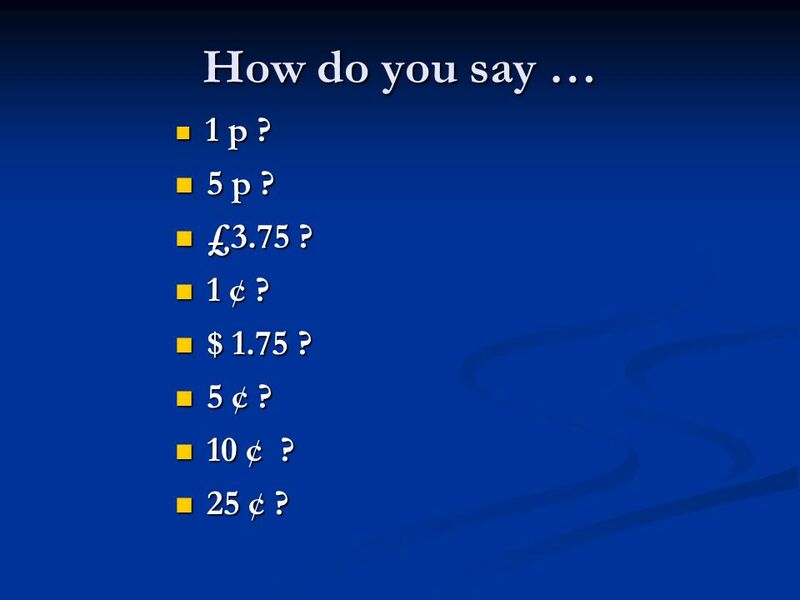 18 How do you say … 1 p ? 1 p ? 5 p ? 5 p ? £3.75 ? £3.75 ? 1 ¢ ? 1 ¢ ? $ 1.75 ? $ 1.75 ? 5 ¢ ? 5 ¢ ? 10 ¢ ? 10 ¢ ? 25 ¢ ? 25 ¢ ? 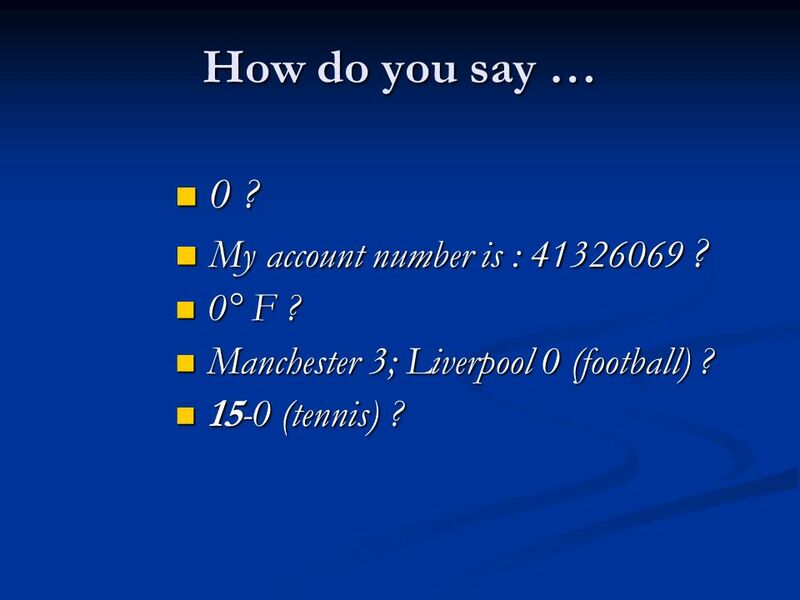 Download ppt "How to say numbers (Abridged Version). 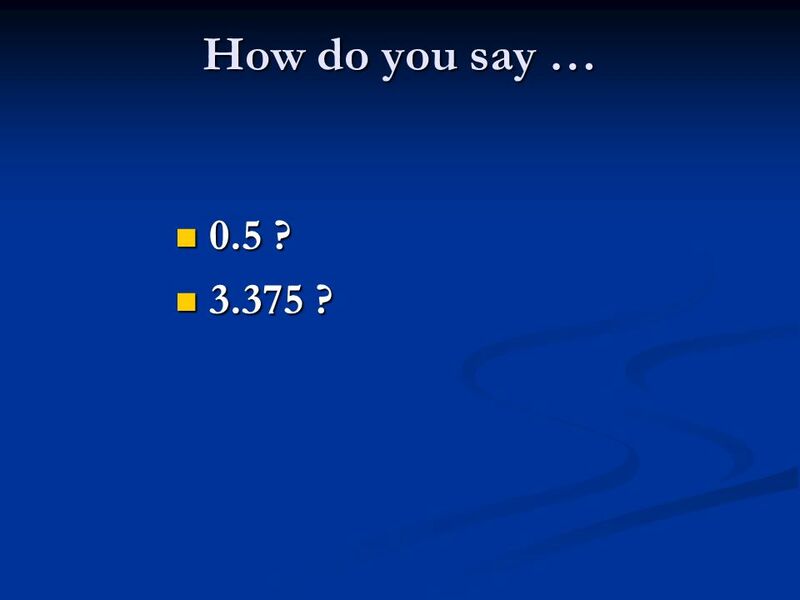 How do you say … 325 ? 325 ? 719 ? 719 ? 3,077 ? 3,077 ?" 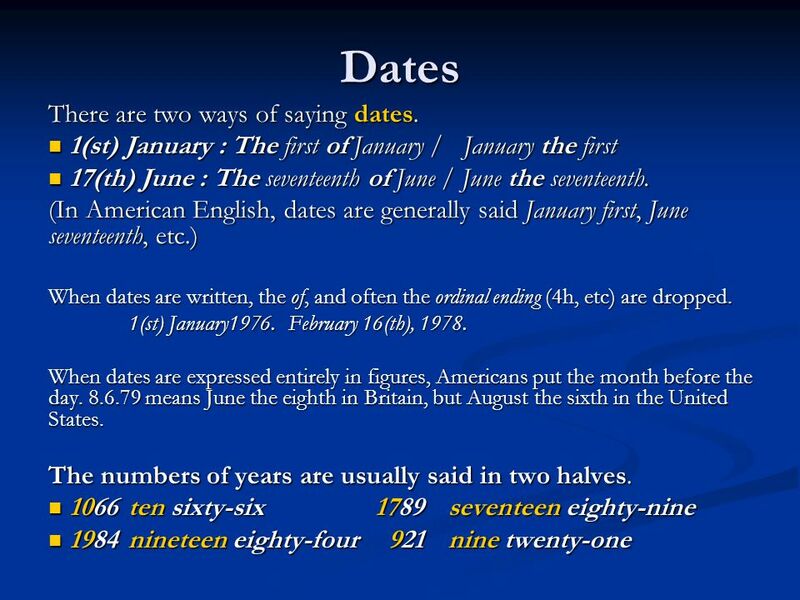 We use numbers to talk about dates & festivals.. 6six6ththe sixth 1one1stthe first 2two2ndthe second 3three3d3dthe third 4four4ththe fourth 5five5ththe. HundredsTensOnes 111 HundredsTensOnes 152 HundredsTensOnes =143. 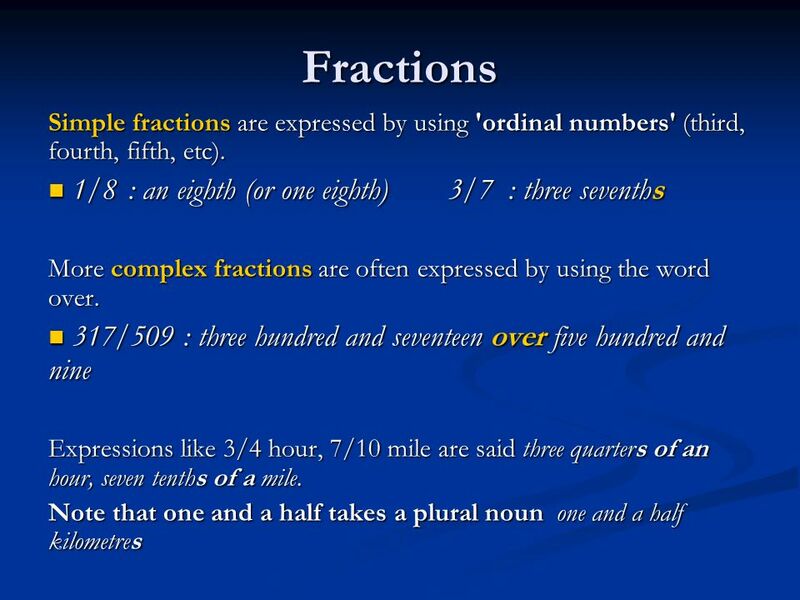 MATH DRILLS. 376 three hundred seventy-six 508 five hundred eight. Created by Hunter Brown Summer What is a Number? 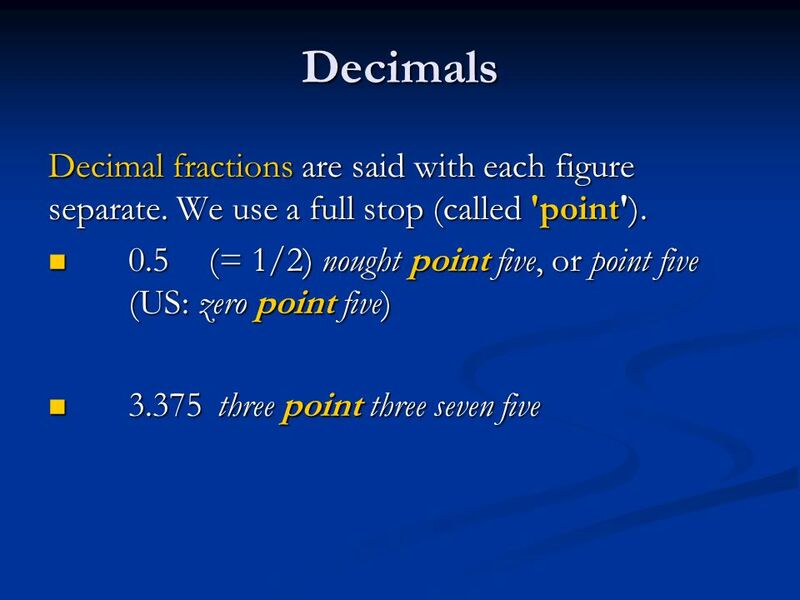 Numerals or figures 1/2 √5 3 π 25 XLI 101 1,492 MCM 500,000 Numerals or figures 1/2 √5 3 π 25 XLI. 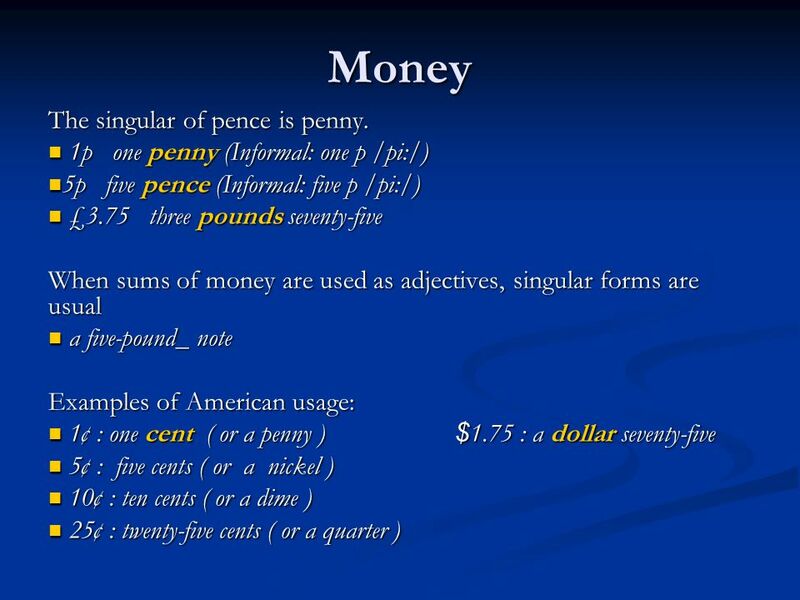 Money, fraction, Decimals, percentage, Dates, phone numbers.